Hard Times Prompt Calls For Zany Medicaid Measures : Shots - Health News Businesses and people pushing for changes in Medicaid policies are taking advantage of strained state budgets to make their case. Some of the suggestions are offbeat. 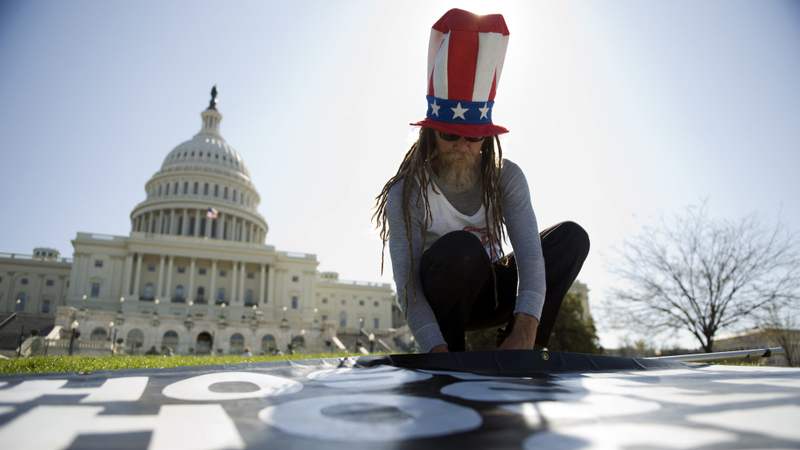 David Wilson of Florida, with the Stop Infant Circumcision Society, works on a readies a sign for a protest in Washington last March. When New York's Medicaid director asked the public for money-saving ideas, the most popular suggestion, as measured by the sheer volume of emails, left him a bit red-faced: End payments for routine circumcisions. Though the idea didn't make the cut for New York's latest cost-curbing plan, it's just one example of how interest groups, such as the anti-circumcision group Intaction.org, businesses and other policy proponents are pushing to capitalize on states' dire Medicaid shortfalls. "At budget time, you've got many organizations coming in talking about how their product could save us millions or billions," said Deborah Bachrach, who directed New York's Medicaid program and now works for Manatt, Phelps and Phillips, a law firm. "Sometimes there were good ideas there, other times there weren't." In California, for instance, a measure became law last week that would, among other things, pay for automated medication dispensing devices for Medicaid patients beginning in July. Lawmakers said that could save $140 million a year. The proposal is short on details. But, to reach that $140 million goal, "it would have to be a pretty large program," said Stefan Solvell, the founder of e-pill, LLC, a large dispensing-device manufacturer. He said the devices improve medication compliance, reducing the need for hospitalization. (Solvell hadn't heard of the proposal before Shots called). In South Carolina, state Rep. Bill Herbkersman, a Republican, is aggressively pushing a $3 million plan he says will prevent costly emergency room visits by Medicaid patients. The money would pay for "medical monitoring devices" in the homes of 3,000 patients who frequent ERs. Herbkersman told a local paper that only one California-based company makes such a device. The monitor would essentially speed-dial nurse-operators who could advise patients and avert an ER visit. But, to break even, the call center would have to prevent around a half-dozen emergency room visits per patient each year, said Myles Riner, a California-based emergency doctor and consultant. Local health industry lobbyists declined to comment, saying they could not afford to sour relations with a key lawmaker. The American College of Emergency Physicians blasted the plan for unfairly blaming the high cost of health care on emergency patients. The states are facing collective budget short falls of well over $100 billion in 2012, according to the Center on Budget and Policy Priorities, a liberal think tank, and much of it is driven by Medicaid. But, doctors and hospitals have already faced steep cuts, and the federal health law limits states' authority to cut back Medicaid enrollment. That can make novel ideas - even if they come from left field - appealing to lawmakers and officials. If you come across any unusual Medicaid saving ideas in your state, send them our way.